Now available! The Lion King is the story of a young lion cub named Simba who struggles to accept the responsibilities of adulthood and his destined role as king. To bring the classic 1994 film to life, Disney turned to the story's roots, its rich mythology, powerful human drama and primal African rhythms to create a fantastic new musical unlike anything Broadway has ever seen. Winner of 6 1998 Tony Awards, including Best New Musical, and with the fabulous Elton John/Tim Rice songs, The Lion King is an adventure into another world. 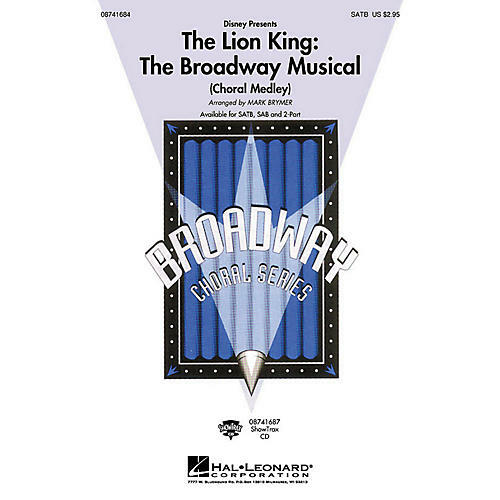 Songs include: Can You Feel The Love Tonight, Chow Down, Circle Of Life, Endless Night, Hakuna Matata, I Just Can't Wait To Be King, The Lioness Hunt, They Live In You.Available separately: SATB, SAB, 2-Part and ShowTrax CD. Approx. Performance Time: 9:15.